Born with the name Marion Robert Morrison in Winterset, Iowa. Wayne was Scotch Irish on his father and Irish on his mother's side. During Wayne's childhood, he moved to Palmdale, California then to Glendale, California. While attending Wayne started working in small local movie companies. And also started playing football in high school and participated in the Glendale school team before being recruited by the University of Southern California (USC). Wayne began his movie career in the 1920s. In 1928, he played an extra in John Ford's Four Sons. In 1930, he had his first leading role in The Big Trail. Wayne was nominated for an Academy Award for Sands of Iwo Jima. One of his most important roles was that of Ethan Edwards a desperate man looking for his niece kidnapped by Comanche in the 1956 western movie The Searchers, directed by John Ford. The Alamo was nominated for several Academy Awards. It won the award for Best Sound. Wayne received an Academy Award and Golden Globe Award for his role in True Grit. His last role was in The Shootist. In 1999, the American Film Institute named Wayne thirteenth among the Greatest Male Stars of All Time. 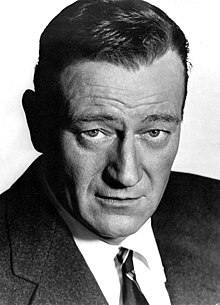 A Harris Poll released in 2007 placed Wayne third among America's favorite movie stars, the only star on the list who has died and the only one who has appeared on the poll every year. Wayne had lung cancer in the 1960s. He had a lung removed and recovered. He died of stomach cancer. 1932 Running Hollywood Himself Charles Lamont Uni A two-reel short. 1940 Screen Snapshots Series 19, No. 8: Cowboy Jubilee Himself Ralph Staub Rep A one-reel short also featuring Gene Autry and Roy Rogers. 1941 Meet the Stars: Past and Present Himself Harriet Parsons Rep A promotional short. 1949 Screen Snapshots: Hollywood Rodeo Himself Ralph Staub Col A documentary short. 1951 Screen Snapshots: Reno's Silver Spur Awards Himself Ralph Staub Col A documentary short. 1951 Screen Snapshots: Hollywood Awards Himself Ralph Staub Col A documentary short. 1952 Miracle in Motion Narrator Rep Wayne narrates this fund-raiser for the benefit of the United Cerebral Palsy Foundation. 1955 Screen Snapshots: The Great Al Jolson Himself Ralph Staub Col A documentary short salute Jolson. Wayne is one of the celebrities shown in the film. 1970 No Substitute for Victory Narrator Robert F. Slatzer AK A short in support of America's involvement in the Vietnam War. With General Mark Clark, Martha Raye, Sam Yorty, General William Westmoreland, and Lowell Thomas. 1971 Directed by John Ford Himself Peter Bogdanovich AFI A documentary, narrated by Orson Welles. 1972 Cancel My Reservation Himself Paul Bogart WB Wayne, Bing Crosby, Johnny Carson, and Flip Wilson made brief, unbilled cameo appearances in this Bob Hope comedy. Filmed in Technicolor. WB With Eddie Albert, Clu Gulager. Filmed in Panavision and Technicolor. The first of Wayne's two cop films made in the wake of Clint Eastwood's success with Dirty Harry (1971). 1976 Chesty: Tribute to a Legend Himself John Ford A tribute documentary on the most decorated U.S. Marine, Gen. Lewis B. "Chesty" Puller. Completed in 1970, but not released until 1976, three years after Ford's death. ↑ 75.0 75.1 Fagen, p. 249. ↑ "Searching for John Wayne in the Alabama Hills". BBC News. BBC. October 9, 2013. Retrieved October 10, 2013. ↑ Filmed as Arizona, the movie's makers applied to the New York State Censor Board for a new title, Men Are Like That, and the film was reviewed under that title in New York and other places. ↑ Not the radio comedian. ↑ A Walter Wanger production released thru United Artists. ↑ Tom Tyler played Wayne's role of Stoney Brooke in some of the later Mesquiteers series. ↑ These same incidents also formed the basis of the film The Baron of Arizona (1951), starring Vincent Price. ↑ The change in title was probably done to avoid confusion with an earlier Wayne film called The New Frontier (1936). ↑ Jennifer Jones' son, Robert Walker, Jr., appeared with Wayne in The War Wagon (1966). ↑ Namely, The Moon of the Caribees, In the Zone, Bound East For Cardiff, and The Long Voyage Home. ↑ When the film was re-issued in the 1950s Wayne and Susan Hayward received top billing in the advertisements. ↑ This story was also filmed in 1914, 1922, 1930 and 1955 with, respectively, William Farnum, Milton Sills, Gary Cooper, and Jeff Chandler in the Wayne role. Farnum also plays a supporting part in the Wayne version. ↑ This was Clift's first film, although the second one he made, The Search (1948), was released before Red River. ↑ Also filmed as Marked Men (1919), Hell's Heroes (1930), and Three Godfathers (1936) with, respectively, Harry Carey, Charles Bickford, and Chester Morris in the Wayne role. ↑ One of only three sound films Hardy did without comic partner Stan Laurel. ↑ The working title for Rio Grande was Rio Bravo, which was also the title used for a 1959 Wayne Western. The title Rio Grande had been used for a 1949 B-Western starring Sunset Carson. ↑ The character Wayne played here and in Fort Apache is the same character (just as it is in the short stories on which they are based), but here the character's last name has an added "e". ↑ Ward Bond plays a movie director named "John Dodge", an obvious spoof of the film's real director, John Ford. ↑ Produced by U.S. Information Agency. ↑ Reputedly, Curtiz was extremely ill during the shooting, as a result the majority of the film was directed by Wayne who refused to take credit. ↑ James Stewart received top billing over Wayne in the film's advertisements, but Wayne has top billing in the film's opening credits. ↑ Wayne had originally played Sherman in an episode of the TV series Wagon Train entitled "The Colton Craven Story." That episode was directed by John Ford. ↑ Technicolor prints were apparently used for only the Cinerama presentation while general release print used Metrocolor. ↑ Aside from the documentary film Chesty: Tribute to a Legend (1976). ↑ U.S. Department of Defense / Armed Forces Information & Education. ↑ Walker Jr's mother, actress Jennifer Jones, made her film debut opposite Wayne in New Frontier (1939). ↑ Vera Miles appeared in some scenes as Wayne's wife, but these were cut from the final print. ↑ George Plimpton made a TV documentary about the making of this film. In this documentary, entitled "Shoot-out at Rio Lobo". Wayne frequently accidentally referred to Plimpton as "Pimpleton". ↑ Warren Oates would play Rooster Cogburn in a 1978 TV film entitled True Grit: A Further Adventure. This page was last changed on 20 March 2019, at 15:09.